Self-contained keypad system for door and gated entrances. With Codes That Can Be Programmed Using 4 Or 5 Digits And Activate One Or Both Relays. Stores Database Information in Memory when the Power Goes Out, Ensuring Immediate Startup and Operation When Power is Restored. With Two Relays That Can Be Controlled Individually Or Together. Well-Crafted Weather-Resistant Design is Highly Vandal-Resistant. 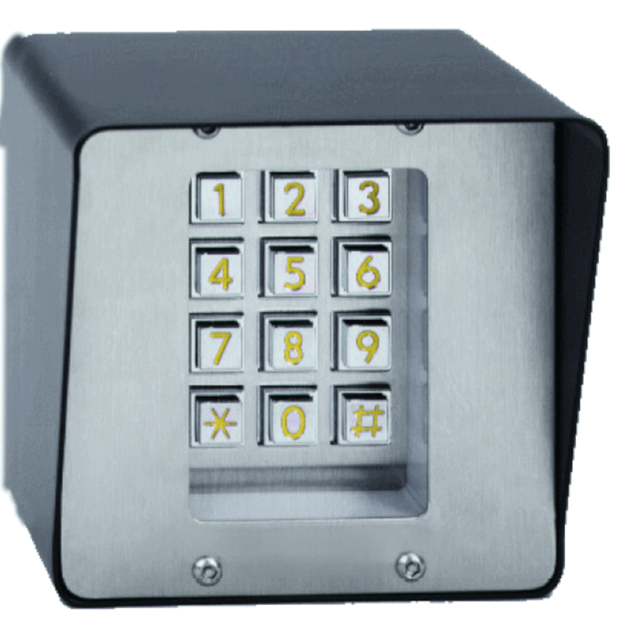 By Disabling Keypad For 3 Minutes If An Unauthorized User Has Attempted Too Many Incorrect Entry Codes. System Can Be Programmed To Permit 1 - 10 Attempts Prior To Engaging Lockout.